Jazz music may be America’s invention but like any great art form, it knows no borders. Jazz is as beloved in Tokyo as in New Orleans, as popular in Vienna as Chicago. 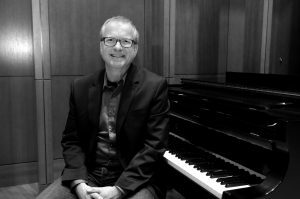 And that’s the reason why Dr. Brian Coyle recently co-founded and now helps lead, as its vice president, the new International Society of Jazz Arrangers and Composers (ISJAC) of which the Hope College Jazz Studies program is a founding consortium member. Hope is one of only two liberal arts colleges on ISJAC’s directory of respected and innovative jazz schools. Coyle is Hope’s director of jazz studies so it would seem natural for the college to quickly sign up to join such an organization. ISJAC is the first association, Coyle points out, specifically created for the service, advancement, and encouragement of jazz composers and arrangers. Numerous organizations exist for jazz performers but Coyle and his international colleagues are eager to highlight the achievements and advance the appreciation of jazz composition. The group held its first symposium — with some of the top names in jazz composition presenting and performing like 22-time Grammy winner Chick Corea — just three weeks ago in Tampa, Florida. “For Hope to be on the same list as some of the top jazz schools in the country and the world is exciting and quite a testament to what we have happening here,” says Coyle, a jazz composer himself who has also performed with the likes of Al Jarreau, Roberta Flack, the John Cooper Jazz Orchestra, and Ravi Coltrane, to name a few. Coyle seeks regularly to de-mystify what improvisation within composition means. The two terms may seem diametrically opposed, but it’s something we see everyday, and not just in jazz music. Though classically trained on trumpet but also a pianist and drummer, Coyle’s deep affection and appreciation for jazz music stems from his fascination of taking musical control of a piece while giving it up at the same time. He loves that jazz is conversive and freestyling which makes it unlike any other kind of music. Its ad-libbed call-and-response vocal elements and its polyrhythms are patent art, as “patent” as ever-evolving jazz can be, and it grew out of blues and ragtime traditions in the early 20th century. Since then, jazz music has played its way through numerous eras such as big band, bebop, free jazz and jazz-rock fusion, but all had improvisation at the center. Yet for many, improvisation, especially when mentioned in the same breathe as composition, is a mystery. Coyle knows this and seeks regularly to de-mystify what improvisation within composition means. The two terms may seem diametrically opposed, but it’s something we see everyday, and not just in jazz music. The freedom, individuality, and collective art of jazz is “what makes it so cool,” Coyle declares with an artist’s flourish. And that means, then, that a jazz piece — much like a work meeting attended, a basketball game played, or a day lived — is never performed the same way twice. The freedom, individuality and collective art of jazz is “what makes it so cool,” Coyle declares with an artist’s flourish. Even though recorded jazz sales make up less than two percent of today’s global market, jazz music still has a ubiquitous place in American culture and society. It often pops up as the underscore in numerous television commercials and shows, and in the recent multi-Academy-nominated film, LaLa Land, which placed jazz music at the center of its storyline. At live music venues, jazz music is undoubtedly alive and well. This all bodes well for Coyle, Hope and ISJAC. The more jazz music is visible and demanded, the more Coyle and others have to compose and arrange. And that means the more Hopes students will have opportunities to learn and perform, too. Thanks be to Brian Coyle whose soul-filled soul is a gift to all of us. And to Eva who can write, oh can she ever write!